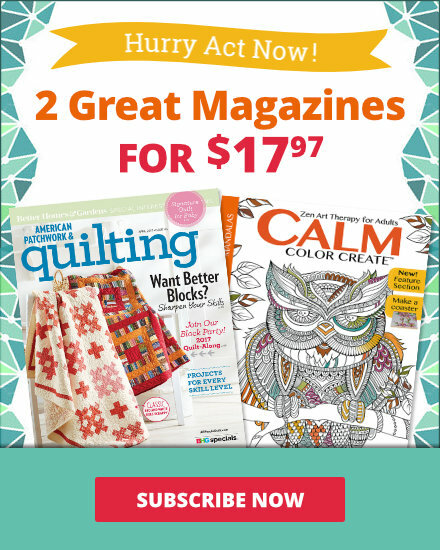 See the featured projects and web-exclusive patterns from the Quilts and More Spring 2016 issue. 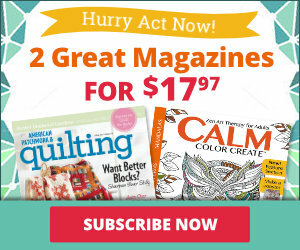 The Spring 2016 issue of Quilts and More is on sale from January 19--April 18. Writing in a journal is more fun with a coordinating journal cover and pencil pouch. 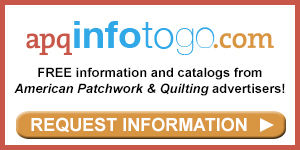 A stitch-and-flip technique using marked squares eliminates the need for templates and cutting odd-shape pieces. Bright scraps plus solid white make an eye-catching quilt. Get the digtial issue here. Try your hand at appliqué by using felted wool to make a small project blooming with creativity. A one-block wonder, this quilt is made from the same block that is repeated and rotated to create a secondary design. To re-create this throw, use a variety of prints in similar colors to make one block that is repeated and then rotated to create an interesting design. Build blocks around a center rectangle in a quick-to-sew throw that will leave you plenty of time for other leisure activities. This petite bag is perfect for a take-along sewing project. Make a customized tote by substituting one of the plain panels with patchwork. For the blue bag, designer Keiko Clark English paper-pieced 1" hexagons to make a rectangle. 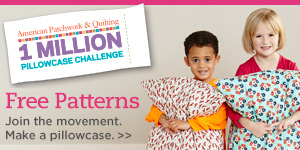 Strip sets make it easy to construct this baby quilt. Focusing on gray for the background, editorial content chief Linda Augsburg used two prints in two colors for the blocks, placing greens in one diagonal direction and teals in the other. To create a gradation of color diagonally across her quilt, senior editor Elizabeth Tisinger Beese used a tan background and a variety of blues, reds, and yellows. For a quick version that can be completed in a day, editor Jody Sanders eliminated piecing the blocks and instead used squares of four different prints. An array of solids arranged in vertical rows creates a rainbow of waves. A quick-to-piece table runner and coordinating place mats in a calming color combo add interest to an inviting tabletop. Mix playful florals and geometrics for a fun table runner and matching place mats. Sew, cut, stagger, and repeat. 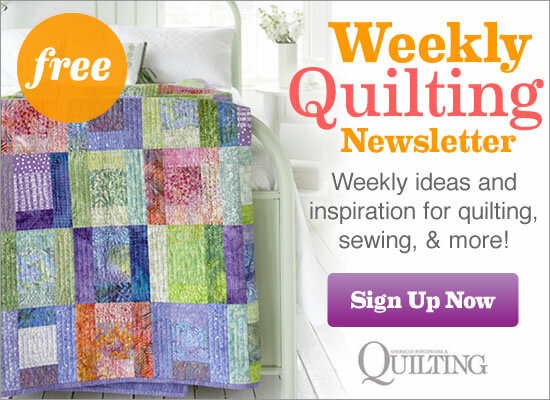 Stitch together strips to create a quilt with striking visual impact. Designer: Nancy Shamy of Kenzie Mac & Co.
Make a statement by stitching scraps into a large bag that’s ideal for shopping or an overnight stay. Use specialty threads and the decorative stitches on your sewing machine to appliqué spinning fabric circles across a quilt top.